If you or a loved one has been injured in a car accident in the Bellingham area, you may be entitled to recover financial compensation from the person or party who is responsible for causing the collision. Washington state law permits accident victims to recover damages for their injuries, medical bills, lost wages and future earnings, pain and suffering, and other damages. The award-winning Bellingham accident attorneys at Davis Law Group have the skills and years of experience needed to help accident victims and their loved ones get the compensation they deserve after a life-changing accident. Call our office at (206) 727-4000 or use the confidential contact form on this page to request a free consultation with our legal team. Living in Bellingham is like being a world away from the hustle and bustle of Seattle. But with its growing population approaching 100,000 people, life in Bellingham is a far cry from living in a small town. With that many people, traffic congestion becomes a challenge and accidents of all kinds happen every day. Washington state law allows for injury victims to pursue a civil legal claim against any person or party who is responsible for causing their injuries. Personal injury claimants have three years from the date of the incident which harmed them to pursue a claim, otherwise the claim will be forever barred by the court system. For this reason, it is important for injured victims to consult with an experienced personal injury lawyer sooner rather than later. Davis Law Group offers a variety of consultation options including conference calls and Skype interviews. Davis Law Group is dedicated to making this process hassle free and we will even send someone to come meet with you if that’s what you need, as we are firm believers that the personal injury legal process should be as easy as possible for accident victims and their families. Call our office today at (206) 727-4000 to discuss your options and have your personal injury or wrongful death case reviewed free of charge. Let us know if you have any transportation difficulties and we'd be happy to make arrangements to meet your family's needs. We are happy to meet your family’s needs and make arrangements for transportation if necessary. The city of Bellingham is nestled in the heart of a key transportation corridor, with Interstate 5 running directly through town and a key port to the west. People travel to Bellingham from all over Washington state, and many Canadian visitors travel to or through Bellingham every day. Bellingham is also home to Western Washington University (WWU) and by extension, more than 15,000 students live in town during the school year. This creates an additional influx of commuters and people otherwise traveling on Bellingham roads, highways, and arterials. In fact, 2018 saw a record year of freshman students at WWU - meaning a glut of less experienced and potentially distracted drivers. Fortunately, Bellingham police are available to serve the public and investigate any auto accidents that may occur. The key to any successful car accident injury claim is documented evidence about the incident itself and the responding officer's investigation into the circumstances and contributing factors. A thorough police traffic collision report (PTCR) is alwasy helpful in investigating any auto accident case. If you or a loved one has been hurt in an accident near Bellingham, it is likely in your best interests to consult with an experienced car accident lawyer. The attorneys at Davis Law Group work on a contingency fee basis which means you owe nothing until we recover money on your behalf. Call our office at (206) 727-4000 or use the confidential contact form on this page to request a free legal consultation with our award-winning legal team today. Like all cities in Western Washington, Bellingham is struggling to adapt its infrastructure to meet the needs of a growing population. One of the many challenges facing cities like Bellingham is pedestrian volume. This is particularly challenging in cities that have a higher than average density of young and working people who choose to live near work or school and commute on-foot. Bellingham Bay is also home to one of the Northwest Region's top ports for cruises from Bellingham to Alaska. As such, many people spend the night before their cruise touring the city, walking along South State Street or Lakeway Drive to get to St. Clair Park or Boulevard Park. Pedestrian accident victims often face unique legal challenges due to the nature of these cases, especially when it comes to insurance coverage. Pedestrians who only commute on-foot typically do not carry their own auto insurance coverage if they do not own a vehicle. If an injured pedestrian was not carrying an auto or health insurance policy at the time of the incident, they may have difficulty getting their initial medical bills paid for. Even if the driver who is responsible for causing a pedestrian collision has adequate liability insurance coverage, the insurance company will not pay for your medical treatment as you go. Pedestrian accident injury claims are settled all at once, with one final lump sum being paid out to cover your medical costs, lost wages, and other bills. The remainder of your settlement goes directly into your pocket. Call the award-winning pedestrian accident lawyers at Davis Law Group today to request a free legal consultation with our team. We work on a contingency fee basis, which means there are no up-front costs and you owe nothing until your case is successfully resolved. Chuckanut Drive is one of the most popular scenic route roadways in Washington state. It has been featured by The Seattle Times, MyScenicDrives.com, and NWTripFinder.com as an attractive destination for passenger vehicles and motorcyclists in search of breathtaking views. In general, Bellingham is a popular destination for motorcyclists taking a break from long rides to and from Canada. But motorcycle accidents happen more frequently on Chuckanut Drive and throughout the city of Bellingham than officials would like to admit. In fact, our very own study on motorcycle accident hotspots in Washington state found that Chuckanut Drive is one of the most dangerous roadways for motorcyclists in Washington state. There were six serious injury collisions involving motorcycles on Chuckanut Drive from 2016-2018 alone. Motorcycle accidents often result in catastrophic injuries due to the high-speed nature of these collisions, in addition to the lack of protection most riders are equipped with. And to make matters even worse, motorcyclists are not legally required to purchase auto insurance coverage in Washington state, which means many bikers are riding around without any insurance to cover them in the event of a serious accident. Call the award-winning motorcycle accident lawyers at Davis Law Group or use the confidential contact form on this page to request a free legal consultation with our attorneys today. We can help you better understand your legal rights and help you to ensure you get the medical treatment you need to make a full recovery from your injuries. Serious and life-altering bicycle accidents happen all the time in Washington state, and Bellingham is no exception to this rule. Bellingham's large student population means an increased number of bicyclists commuting around town at any time of day, either to attend school or commute to work. And in many cases, bicycle accident victims do not understand their legal rights after an accident. For example, many bicyclists are unaware that their auto insurance policy would provide coverage and other benefits to them if they were injured in an accident while riding a bicycle. Personal Injury Protection (PIP) coverage is one type of coverage that will pay for an accident victim's medical bills after a collision, even if the person was riding their bicycle when the injury occurred. Having a thorough understanding of Washington state's contributory negligence laws are also key to successful bicycle accident injury claims, as bicycle accident victims may still be entitled to recover financial compensation even if they were found to have been partially liable for the accident that harmed them. Contact the award-winning bicycle accident lawyers at Davis Law Group today to request a free legal consultation with our attorneys and legal staff. We can explain the various legal challenges affecting your case and help you determine if hiring a lawyer is in your best interests. Bellingham, nicknamed the “City of Subdued Excitement,” has a rich and interesting history in the state of Washington. The largest city in Whatcom County, Bellingham is home to PeaceHealth St. Joseph Medical Center and Western Washington University, the two largest employers in the city. 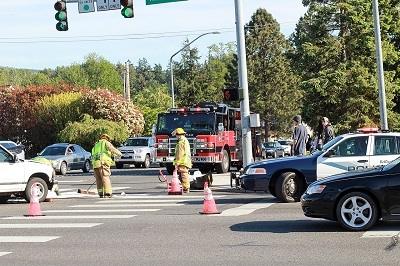 Bellingham also has a significant amount of serious car and truck crashes, drunk driving incidents, and bicycle & pedestrian accidents each year. Whatcom County alone accounted for 2,659 of the collisions in Washington state in 2013. These accidents regularly occur on heavily traveled roads like Interstate 5. "They also took the time to educate me regarding my case so that I was fully aware and understand what the process was and would not feel left out in the dark." "I think it would be in anyone’s best interest to contact an attorney....such as the Davis Law Group."